Goodridge Corners is a future neighbourhood in northwest Edmonton, Alberta, Canada. Subdivision and development of the neighbourhood will be guided by the Goodridge Corners Neighbourhood Area Structure Plan (NASP), which was adopted by Edmonton City Council on February 24, 2014. It includes the Edmonton Remand Centre and the Edmonton Young Offender Centre on the east side of 127 Street, while the Edmonton Police Service's Northwest Campus and Divisional Station is under construction on the west side. It is located on the edge of Edmonton, bounded on the west by the city's boundary with St. Albert (142 Street), north by the city's boundary with Sturgeon County, east by the future realignment of 112 Street, and south by Anthony Henday Drive. 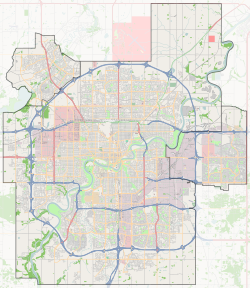 ^ "City of Edmonton : Neighbourhood Boundaries". City of Edmonton - Open Data. City of Edmonton. Retrieved February 4, 2019. ^ a b "Goodridge Corners: New Neighbourhood Proposed in North West Edmonton". City of Edmonton. April 27, 2010. Archived from the original on November 22, 2010. Retrieved January 30, 2011. ^ a b "Naming Committee Minutes" (PDF). City of Edmonton, Naming Committee. December 7, 2009. Retrieved January 30, 2011. This page was last edited on 5 February 2019, at 04:31 (UTC).